I LOVE, LOVE, LOVE infinity scarves! I have a ton of them in a variety of different fabrics – crocheted, knit, silk, linen, wool, cotton etc. I have one for every season as there is never a wrong time or place for an infinity scarf. On a late summer evening, once the sun goes down with a little wind rustling, a light scarf adds warmth and comfort on the patio. In the worst, spine numbing cold a thick, wool infinity scarf can block out chilling winds keeping your neck and chest area toasty warm. I recently made these two crocheted infinity scarves for a very happy customer. 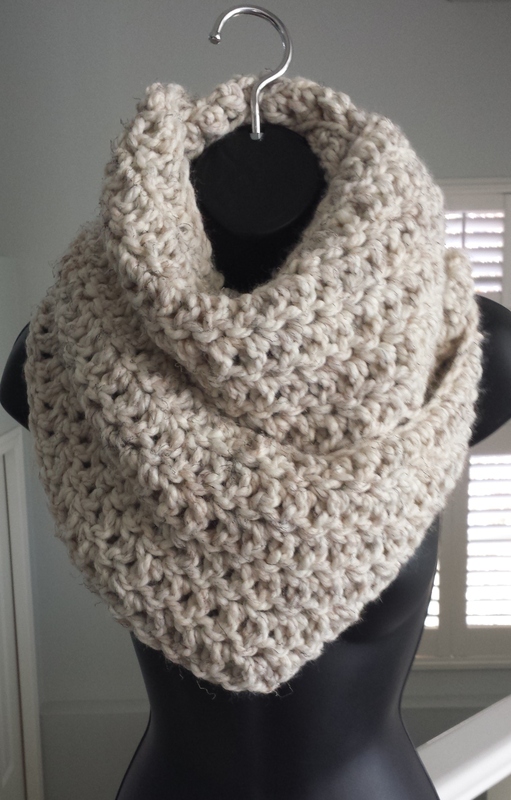 These two wrap three times around for a super cozy look and feel. Both are made with an acrylic/wool blend in a simple pattern of double crochet stitches into the back loops to add a ridged texture. 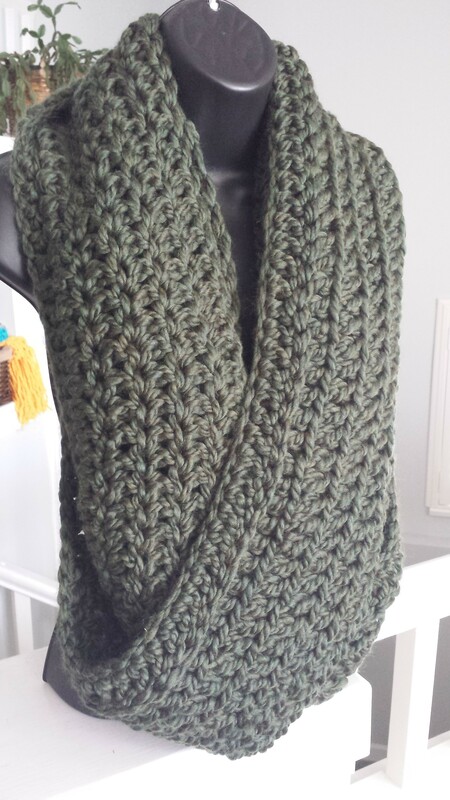 The scarf is crocheted in the round for as many rows as you want for the desired width. I am currently working on putting the pattern on paper, or I should say Word file, so I can share with you all. Stay tuned!!! Getting the creative juices flowing and pouring hours into crafting is hard work and you need a break to re-fuel every once in awhile. When I am working on a project, be it with hook in hand or on my sewing machine, there is a favourite go-to snack. In my house, we call it “B Bread”, there’s no need to mention the full word “banana”, that’s wasting time that could be better spent eating. Pairing beautifully with a tea or coffee, this banana bread is flavourful, moist and you can’t stop at just one slice. As soon as my kid sees a group of three bananas browning on the counter, she gets giddy. Where did this recipe come from? Sad to say I didn’t think this beauty up myself. Back in the early 80s, my elementary school published a cookbook as a fundraiser with contributions from various families. My mom gave me her copy years ago. The cover is long gone, her notes are in the margins of food stained, dog-eared pages — all the signs of a much loved cookbook. It has become a family heirloom of sorts. With everyone remaining anonymous, I wouldn’t have a clue who the baking goddess is who came up with this recipe but whoever you are, kudos to you! I’ve tweaked a few measurements and added a couple new ingredients over the years with the same results ~ yum, yum, yum!! Note regarding using margarine over butter = I’ve discovered you can substitute unsalted butter for the margarine, the difference in taste is negligible but even as a staunch butter-lover, I am convinced the margarine does taste better. Preheat oven to 325ºF, with a rack in the centre. Using either your stand mixer or hand mixer, cream margarine and brown sugar until the mixture is light and fluffy; add the beaten egg and mix well. In a separate bowl, combine dry ingredients. Alternating, add dry ingredients and the mashed bananas in thirds to the creamed mixture mixing each to just incorporate the ingredients, be careful not to over mix. Use spatula to scrape every last ounce of batter goodness into a well-greased and floured loaf pan and bake 50-60 minutes. I like to run a knife through the batter to get rid of any air bubbles before baking. It’s ready when an inserted tooth pick comes out clean. Leave the loaf in the pan to cool for about 10 minutes, then turn out onto cooling rack to let cool completely. I don’t think I’ve ever made it to that point without cutting a slice — it’s really tasty still warm but easier to cut a room temperature. Enjoy! If you have a favourite banana bread or similar loaf recipe, please share! I am in search of a zucchini loaf! It’s sharing time today…..there is a place, or rather a place in time, that I would describe as a personal heaven – it’s around 10 pm in the evening when my always entertaining, ever-loving and exhausting (in the best way possible) daughter has been happily, sound asleep for a couple of hours, the school bags are packed, clothing set out and lunches made for the next day (this level of organization does actually happen about 75% of the time) and there is a general calm over the household. I can smell the aroma of freshly brewed coffee. Feeling serene, I fill my cup, add the requisite cream and sugar and then settle into my big oversized chair. In front of me on my coffee table and the floor below are newly started projects (ok, some not so new), gauge samples spread out all over. There are a myriad of supplies: crochet and knitting needles; stitch markers; scissors and baskets and bags full of …. wait for it….yarn! Surrounded by an array of beautiful hues of colour and simple tools to aid my creative juices, I am peaceful. Not only peaceful, but buzzing with swirling thoughts of “what can I make next?” Make no mistake, you can be peaceful even though your mind is busy. I believe your state of mind rather than the pace determines your level of zen. Happy knitting, hooking, crafting, designing, whatever brings you joy to all of you out there!